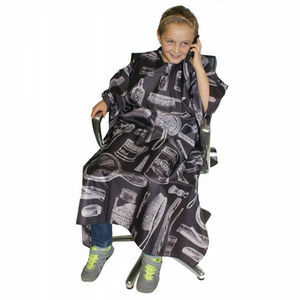 Give your younger customers some retro style with this cool cutting cape featuring a print inspired by vintage barber products on a charcoal background. It's made from water repellent fabric and has an adjustable hook fastening designed to fit all sizes. £7.80 (inc. VAT) Why no VAT? We're a trade wholesaler and quote our prices without VAT to help our VAT-registered customers understand the true cost of a purchase. Designed especially for small necks with a comfortable Velcro fastening.